The year, 2015, is the 70th anniversary of Korean National Liberation. To celebrate the liberation, The UOS Times visited the National Museum of Korean Contemporary History. The National Museum of Korean Contemporary History is located in Jongno, near Gwanghwamun station. The building was first used to house the Supreme Council for National Reconstruction in 1960s, but after going through some repairs and remodeling, it first opened as the National Museum in November 2010. As we enter the museum, we will see a Children’s Museum and a Special Exhibition Hall. Where we should focus, however, is on the third to fifth floors. 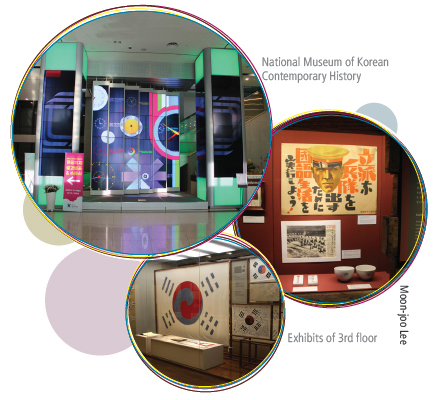 There are permanent exhibitions, displays about Korean history, from the Japan-Korea Treaty to the present. Each exhibit is explained in both Korean and English, so all visitors will be able to understand it easily. Academic materials and historic artifacts are exhibited in a time order, so it is important to follow the guidelines on each floor when viewing displays. On the third floor, we find displays covering the period of Japanese occupation to National Liberation Day. We all learn about Korean history in school, but this museum shows more details than we learn in textbooks. This is possible because the museum exhibits cover only a short period of history, starting from 1876, in such a large place. 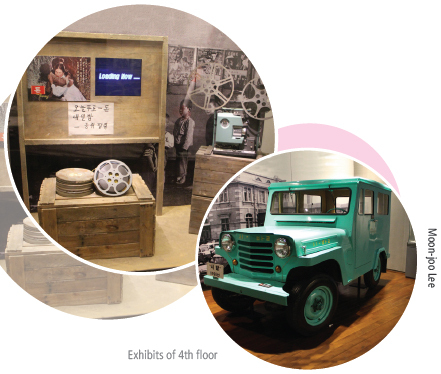 There is another permanent exhibition on the fourth floor, with displays covering the period after National Liberation Day up to the Korean War. As we begin to explore the era, we may assume that this time was the darkest and most hopeless period of Korean history. But as we continue through the fourth floor, our ideas about it will change. We see several holograms and state-of-the art technologies showing that children had aspirations in learning, and the support for education was increasing at that time. These displays show us a contrast with modern learners, bored to death when learning. The National Museum of Korean Contemporary History shows us another side of the time, while most of the museum focuses only on the Korean War. 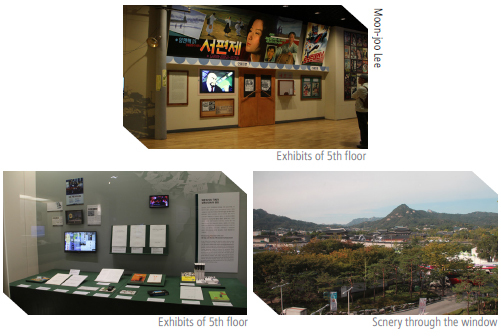 The fifth floor shows us the most recent views of Korea. Here, we realize why Koreans are called a people of will. The exhibition shows the rapid development of Korea in various fields, including shipbuilding and electronic parts. This section will be the most interesting because we can see things that we still encounter in life today, but in a historical context. There is also a replica of the president’s office at the Blue House, with a window at the back. Through this window, we can see the ancient buildings where the Joseon Dynasty stood before, and the present building where the current president is living. It is a lovely view and an excellent replica, so it is worth a photograph. Finally, we come to the eighth floor. Here we find a roof garden where we can see the core of Seoul. It offers one of the finest views in Seoul, with Gyeongbokgung Palace, Cheongwadae, and Gwanghwamun Gate. 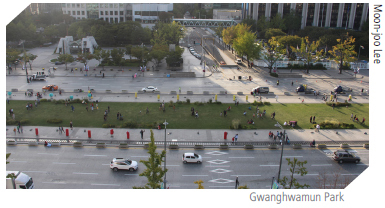 Also, if Gwanghwamun Plaza is hosting a performance or event, we will be able to have a full view just by sitting here. As we visit the museum, we discover some historical events that we likely did not know. To learn more about the exhibits, we can take a guided tour offered in four languages ? Korean, English, Chinese, and Japanese ? at regular intervals. If we want to learn alone, we can opt to scan a QR code located on the homepage in Korean and English. If we find ourselves bored with seeing only the museum, we can choose many other attractions around the area. 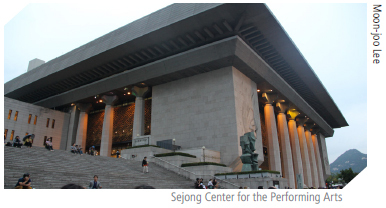 Within walking distance, we can visit Sejong Center for the Performing arts, Gyeongbokgung Palace, and Sejongno Park. Sejong Center has many world-class performances and events, and outside the Center, there are sometimes outdoor performances. If we happen to catch a street performance, it will be a special experience, as well. 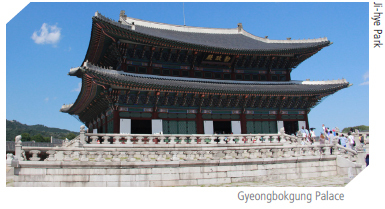 Gyeongbokgung Palace is one of the most famous of Korea’s tourist attractions. Remaining in its traditional beauty since the 14th Century, Gyeongbokgung Palace is always wonderful, but if you want a unique view of the palace, you should aim for a nighttime visit, which will be offered beginning in October. This new way to experience the palace will surely provide a novel memory. 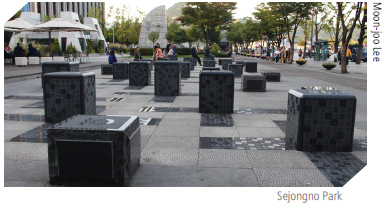 Sejongro Park also offers a special meaning when we visit; inside, we find the Hangeul Geulja Madang, or Korean letter garden. It features Hangeul in a variety of styles written by many people. This park was built to give citizens a rest area, and to tell foreigners something about the scientific creativity and functionality of the script. It was a meaningful visit to this place. We learned a great deal of Korean history in depth. We strongly recommend to everyone who wants to learn Korea’s modern history spend time here. As a visitor, I did not expect to see such good scenery here, since it is located in the heart of Seoul, emphasizing on, this archetypal Korean city on the one hand. When turn around to the other side, we could see beautiful Cheongwadae, Gyeongbokgung, and Samgak Mountain. Don't miss all these views. Photographs are not allowed, but keeping them in our memories will be enough.